I wrote last year about Aiden turning 16 and going to live with his dad when he’d finished school. He’s had a change of heart now and has decided to stay with us and go to Lincoln college instead of Derby college. I’m really happy that he’s staying. The girls, well, that’s a different story! They were looking forward to having a bedroom of their own and they’d planned how they were going to have the furniture arranged and the colour scheme they wanted and now they have to share for another 2 years, at least! I had wanted to get Kaycee a day bed and Ella a cabin bed but now we have to rethink all the plans because Kaycee’s going to need room for a desk to do her homework. We’re going to go with cabin beds that have clothes storage underneath as well as a desk. I’ve been perusing Pinterest for high sleeper bed ideas and saw quite a few I like. 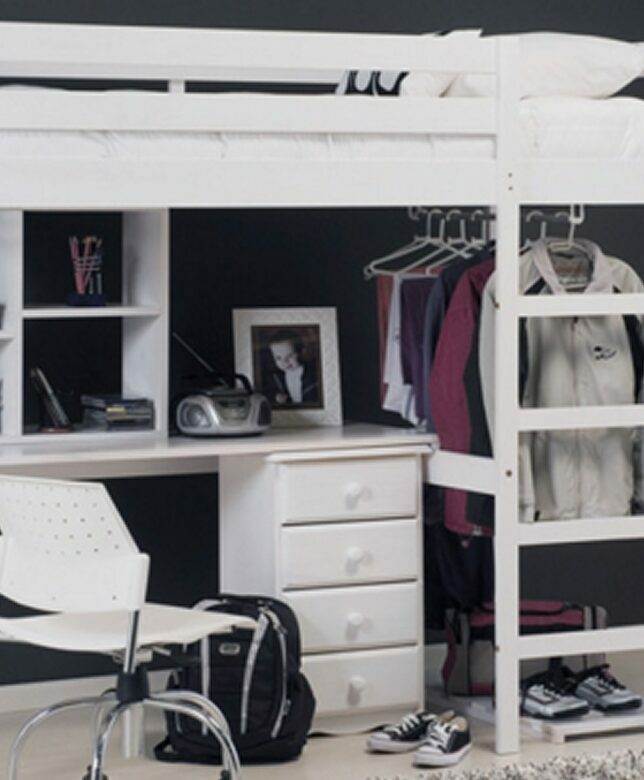 Aiden’s already got a high sleeper with a desk underneath but he rarely uses it and he has another desk in his room so he’d like a bed he doesn’t have to climb up to get in! I’m thinking of getting him a metal single bed but I’m not sure whether to get black or white. I think he’d prefer black but if I get a white one, we can use it for the girls if needed when he does move out. I like this one from Bedstar. We need to get rid of a couple of the bookcases and the wardrobes from Kaycee and Ella’s room to create more space for the beds but we don’t get rid of books so we’ll need to try and relocate them somewhere else in the house! We’re going to let them choose their own bedding so they can personalise their own part of the room. They’ll have to work together to choose new pictures and the curtains will be switched out for new ones. The ones have now are a bit too pink for Kaycee’s liking! Getting them to work together will be a task in itself as they don’t often agree on anything!